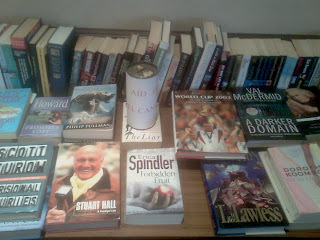 The book loan initiative in aid of Beating Bowel Cancer, started by Club Snooker secretary Kevin Shackleton, has now raised over £100. A fantastic achievement. After sending off the most recent donations, Kevin received a thank you letter from Miriam Lightbown, Community Funding Manager for the Beating Bowel Cancel organisation. The book table is located in the member's lounge and has a wide and ever changing collection of books donated by Club members. It's only 20p to borrow any book for reading. Or, if there's something you really must own, just provide a reasonable donation and it's yours. Please give your support to this worthy cause.